The food of northern Portugal is famously hearty–and very often, meat-centric. In Porto, as elsewhere in Portugal, portions at traditional restaurants can be generous to a fault. Happily, the contemporary food scene is inventive in the city where the Douro meets the sea. Many wonderful Portuguese flavors are now on offer as petiscos (tapas). Petiscos come in smaller portions than a standard main course, and many of the ones we have sampled have been lighter food as well. 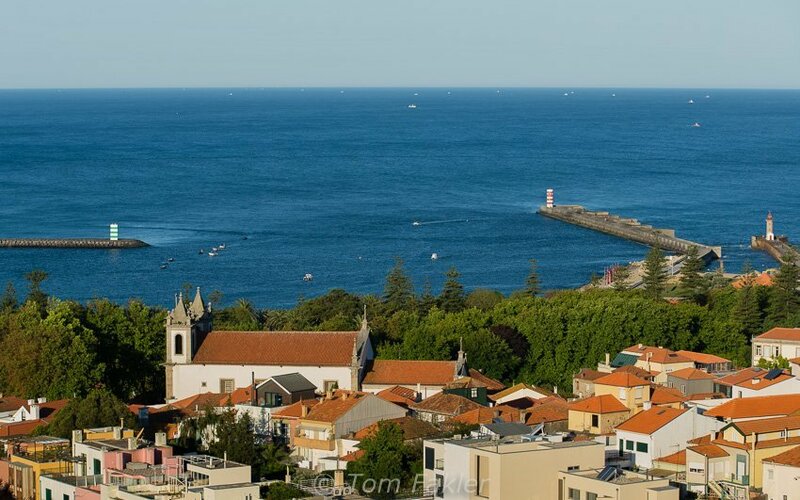 We’ve found to our delight that there are many options in Porto–including superb vegetarian food– to help offset the caloric intake of a Francesinha and other waistline-expanding meals. Here’s a starter kit for you: four of our favorite places to enjoy lighter fare in wonderful Porto. Always an option: lighter fare! Take the Electrico to Foz for good eats at Casa de pasto da Palmeiro in Foz. Grab an outdoor table for a view of the Douro, and enjoy the laid-back ambiance, friendly service and imaginative tapas. 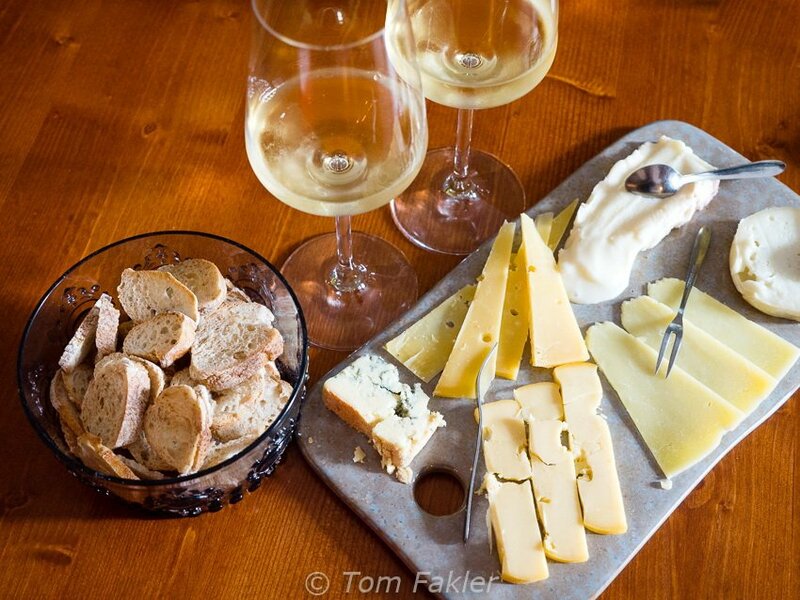 Three tapas makes a meal for two people, accompanied by excellent wines or beer. A bonus is the ding of the tram as it slows down to pass the restaurant on tracks just a meter from the terrace! Fish and chips at Casa de pasto da Palmeiro take the form of battered-fried cod with a side of sweet potatoes, a drizzle of oyster sauce and pickled cucumber. Alheira here is made of game and turnip sprouts, wrapped like an egg roll, and served with sweet chili sauce. Gluten-free options include barley with squid in ink, flavored with coriander and lemon. Stop in at PROVA, an inviting wine bar between Largo São Domingo and Praça do Infante D. Henrique, and travel Portugal in a glass. 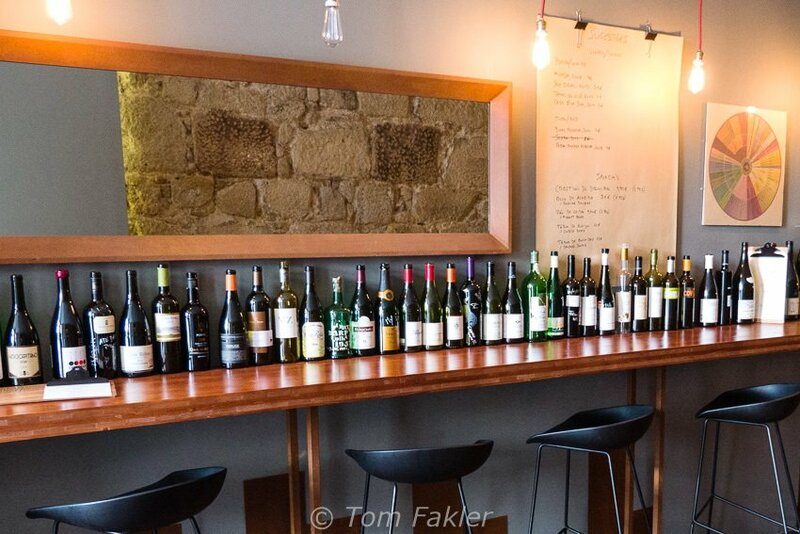 Diogo Amado, sommelier and owner of this delightful spot, lives and breathes wine, and happily introduces his guests to wines known and not-so-known, from every region of Portugal. The mood is relaxed, with soft sounds of jazz music in the background. “When you taste this wine, you taste Douro,” our host smiled. On cue, our taste buds lit up as we quaffed our glasses of Pormenor Douro 2013. Then it was on to the Dão and a glass of Munda 2008, elegant and fruity, aptly paired with a range of cheeses from across Europe, and petingos on bread with red peppers. I can’t wait to return for my next glass-and-plate of Portugal! 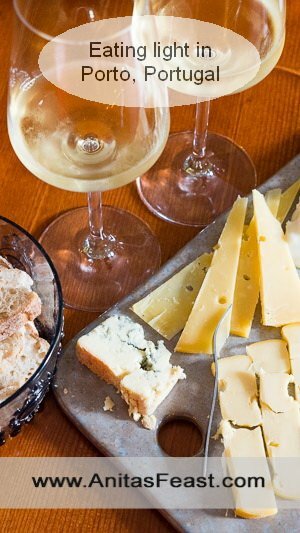 At PROVA, Munda 2008, an elegant white from the Dão region, pairs perfectly with a cheese plate featuring Belgian Emmentaler, St. George and Azeitão cheeses from Portugal, Gouda, a delightfully runny Teleggio and classic Stilton. Looking for respite from northern Portugal’s meat-intensive diet? Essencia, not far from Porto’s BoaVista rotunda and the Casa da Musica has you covered. Daily lunch menus feature ovo-lacto and vegan options, as well as a fish or meat alternative for the main course. An extensive evening menu offers a number of intriguing vegetarian combinations, as well as fresh takes on Portuguese standards (bacalhao, seafood and steaks). 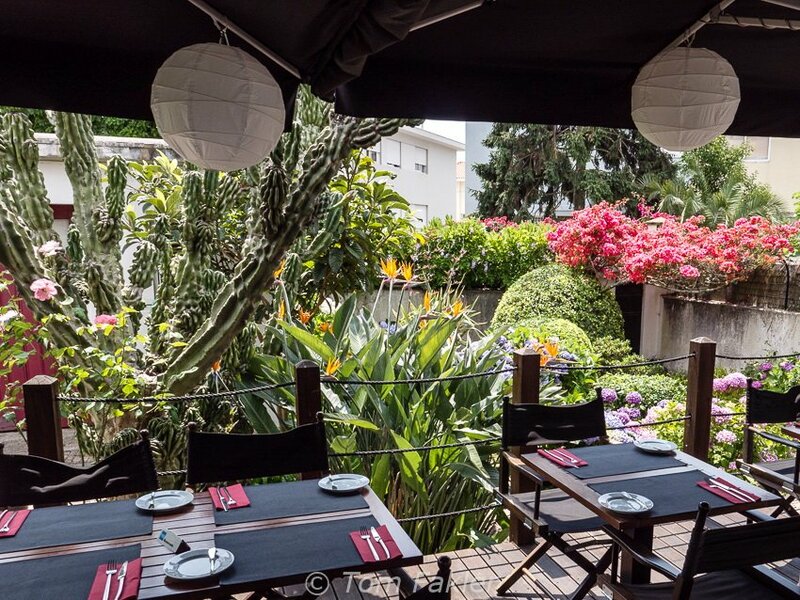 Located in a residential neighborhood about ten minutes on foot from Casa da Musica, Essência offers a choice of eating indoors or on the terrace beside a colorful garden. Owners Isabel, Alexandra and Cristina are hands-on hosts, who braved the region’s meat-loving traditions to provide a refreshing change of pace for the Porto dining scene. 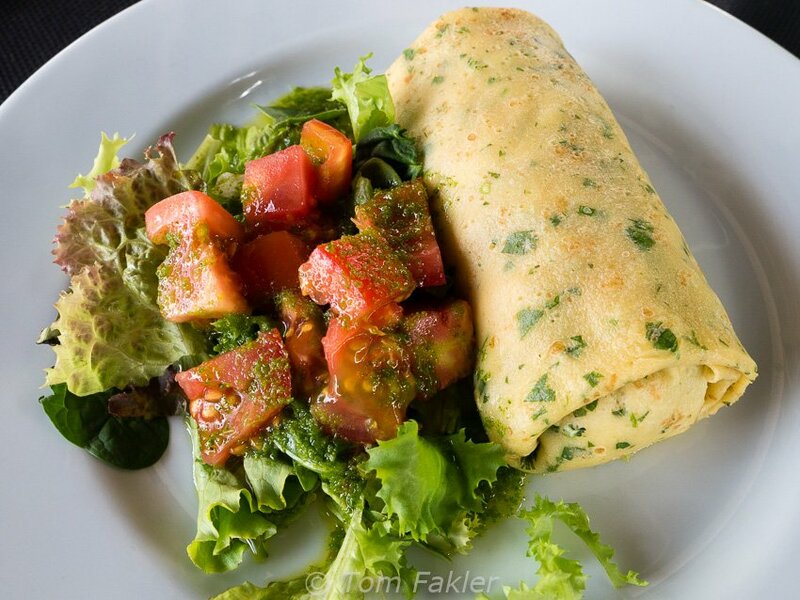 At Essência, a summery crepe folded around a veg-and-ricotta filling was light and flavorful. We also shared a seitan steak, lightly battered and dotted with sesame seeds, and a starter of vegetable bruschetta topped with a melt of Brie, ricotta and “Flemish” cheeses. 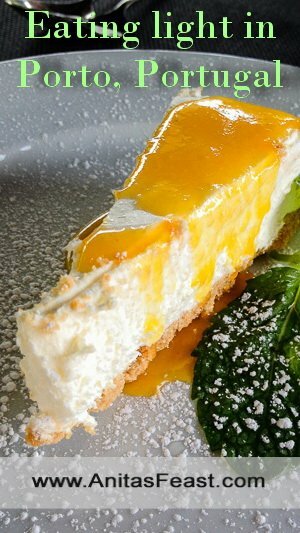 Fluffy passion-fruit cheesecake provided the perfect end to our meal on a sultry summer day. Ready for lunch service at Essência, a vegetarian restaurant in a quiet residential neighborhood, just a few minutes’ walk north of Avenida da Boavista and the Casa da Música. Minutes after this photo was taken, every seat in the house was taken! 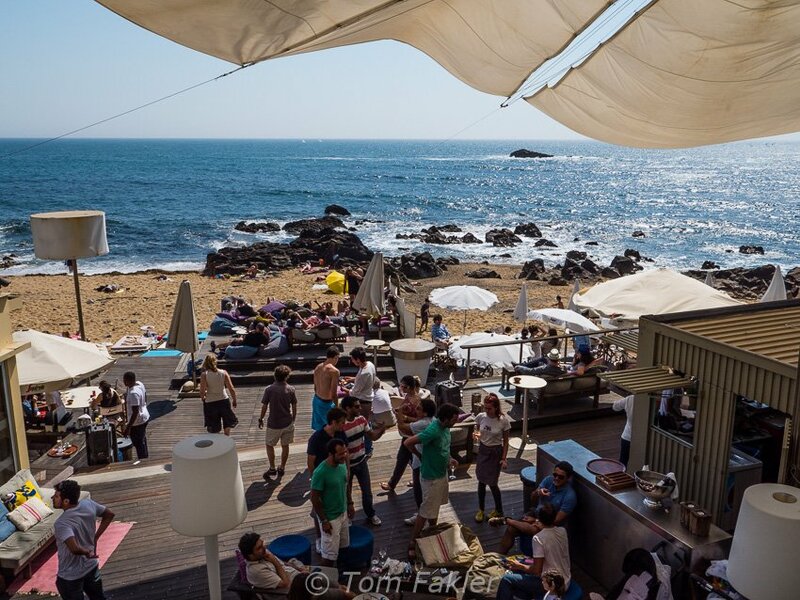 Another Foz destination, Praia de Luz, offers a range of simple dishes. This beachside restaurant offers a sublime setting to enjoy salads, sandwiches and seafood, or simply while away an afternoon over drinks with friends. The restaurant is tucked away along the boardwalk, just steps from the busy thoroughfare above. Take your choice of tables-and-chairs under an umbrella (or inside if you need to escape sun or rain) or plop into deck chairs and enjoy the sea view. Friends gather by the sea in Foz for an afternoon of sun and conversation. 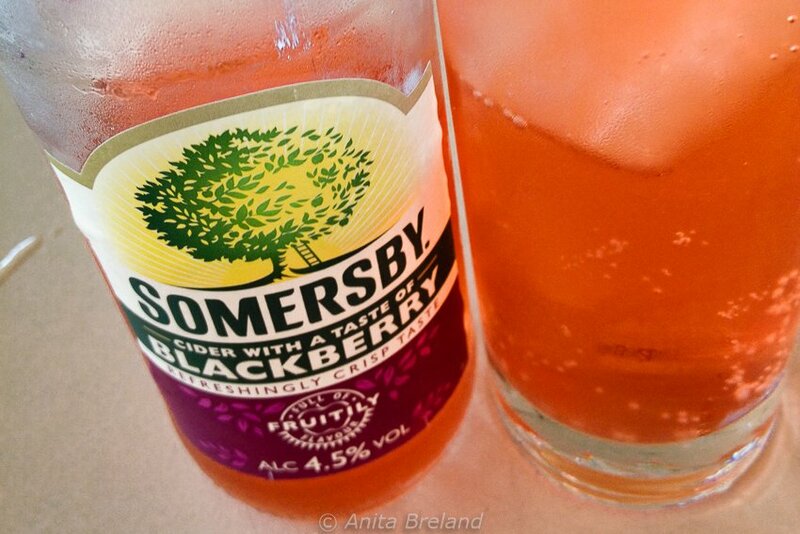 Refreshing on a hot day, a tall glass of cider on ice. Served at Praia de Luz with a side of sea breezes and sunshine. Catavino’s Porto: A Gourmet’s Travel Guide provides background on Porto’s culinary options and neighborhoods, (the article was published in 2013, but is still valid, especially the suggestion to lighten up your meal at a traditional restaurant by ordering a half portion). Another–and one of our favorite–ways to eat light in Portugal is to order seafood. More about that coming soon. In the meantime, here’s a recent recommendation from Gail at Large to whet your appetite. 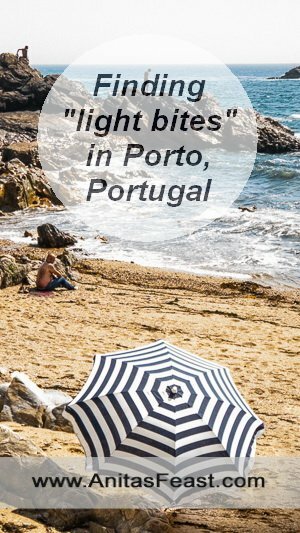 Do you have a light-dining favorite in Porto? Previous articleTravel Photo Roulette #107: Food markets! 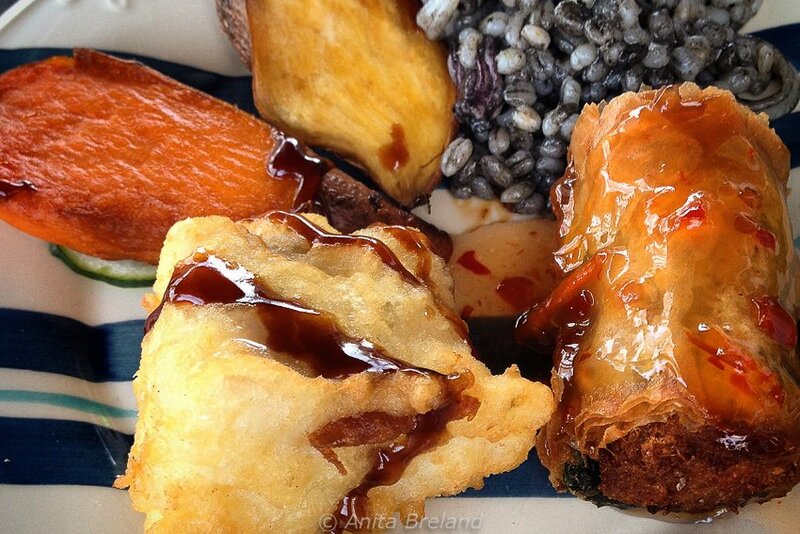 Glad you enjoyed the post…if you enjoy good food, you’ll like Porto! 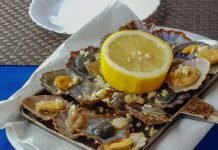 I remember Portuguese food as being very meat based (I visited in the days when I never touched meat) so some of these ideas look very interesting. And I like the idea of Portuguese tapas. There have definitely been advances in presenting Portuguese flavors to non-meat-eaters! Perhaps it’s time for a return visit? Your post about light dining is so timely and important. I love nothing more than a table full of little tastes and plates. Keeping intake in moderation is much easier without too much vino! Glad you enjoyed the post…it should probably be said that one can overdo it anywhere, but these places do make it easy to be a bit more moderate. I’m so looking forward to exploring Porto. I know that with all the wonderful Portuguese food available that I will be using your recommendations at some time for these lighter dishes. They all look wonderful! Headed for Porto? Lucky you…Have a great time and enjoy fabulous food! Whoever invented the tapas concept is a genius! I love to eat that way. Hope to get to Porto next year and i’ll definitely take your recommendations with me. Glad to hear they are coming on board for the non-meat eaters like me. By the time you get there, you will very likely find even more vegetarian choices than now. 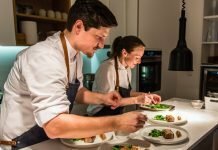 The food scene in Portugal is already great, but is developing rapidly! I haven’t been to Portugal. In fact, we are planning to visit Lisbon this summer. The seafood looks amazing! Irene, if you enjoy seafood, you will be in heaven. Have a great time in Lisbon! Winter in Portugal? How nice for you! Be forewarned that Porto can be rainy and chilly…but there is plenty of good food (and of course, Port) to warm you up. Have a great time!